When I originally wrote my "About This Blog" post, I didn't think I could talk about food all the time. So I figured I'd intersperse by recapping some of my travels. Except that nearly 500 posts later, I'm still talking about food and more food. And did I mention food? Anyway, I've been vicariously reliving my last trip to Vietnam through Cathy of Gastronomy. Her recent post about khao lam (Thai sticky rice in bamboo) reminded me of the first time I tried the Vietnamese version. According to Vietnam News, com lam (Vietnamese sticky rice in bamboo) is a specialty of ethnic minorities in the Central Highlands, who also share kinship with the Thai and Hmong ethnic minorities in Thailand and Laos. So did it originate with the Hmong and spread to Thailand and Vietnam? 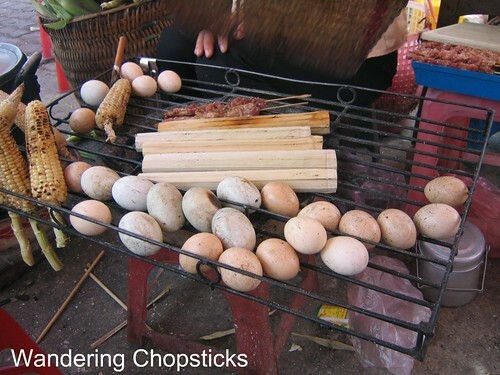 Or is it a Thai specialty that spread to the Hmong, who also brought it to Vietnam? Can any of my readers offer insight into com lam? I had taken a weekend trip from Hanoi to Sa Pa, in the northwestern corner of Vietnam near the Chinese border. 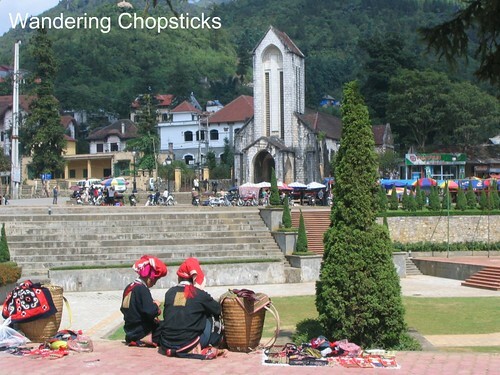 Sa Pa is a former French military station that was settled in the late 1880s. I think the current town though is not in the exact same location? The photo is of the town square, where the Hmong love market used to be held until too many gawking tourists made them move it to a secret location. The women in the photo are red Dao. Other ethnic minorities in Sa Pa include flower and black Hmong. And just on the other end of the central square is the outdoor food market where I ate grilled pork on skewers and com lam. 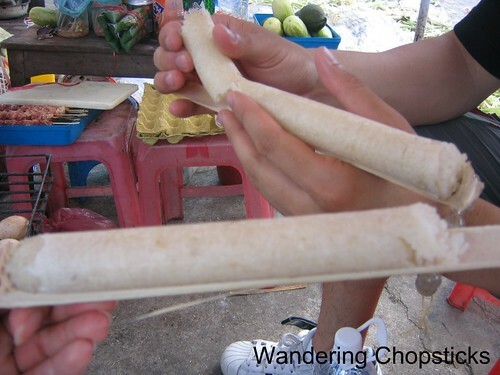 The long tubes are young bamboo with sticky rice inside. Here's a look at the inside of the bamboo. The sticky rice is cooked inside the bamboo, it's not just a pretty container. To eat, we split open the bamboo. The sticky rice takes on a very subtle aroma from the bamboo. For wont of a better description, it makes the rice taste very green. There were five of us and we ate about half a dozen com lam, countless pork skewers, a few ears of grilled corn, some nem chua nuong (Vietnamese grilled pickled pork) (That's the banana-leaf wrapped snack beside the Fanta can), and some drinks for a whopping $5? So if you're ever in Sa Pa, just look for the colorful umbrellas and outdoor food market just to the side of the central square. I've got tons more photos from this trip and the rest of my time in Vietnam that summer, sooo...anyone interested in travel stories or do you want me to stick to the food? Who else ate sticky rice in bamboo? Jeni of Oishii Eats visited Sa Pa this past summer. Cathy of Gastronomy ate Thai khao lam. Kirk of Mmm-yoso ate com lam and hot vit lon (Vietnamese fetal duck eggs). 1 year ago today, French food and a rather odd encounter at Brasserie Astuce Restaurant - Pomona. Sticky rice always tastes so much better when I'm in Vietnam! The Hmong culture is so fascinating to me, I'm still trying to learn more about this ethnic groupl Love your writings and photo's on your previous Vietnam trips. Please recap more often, maybe once a week? This is a special request! Ha! As if you need to ask. Have I mentioned I'm loving the photos? We call it "Zu Ton Fan!" Kinda fun too see that other countries using the same material to cook rice! Well, you never know...some people are only here for the food. ;) Yes, you've mentioned the bigger photos. Playing around with Flickr isn't nearly as difficult as I thought it'd be so big pictures it is. I've heard VNese food in HK is very, very bad and not at all authentic. That's cool to know. I wonder how many other Asians have sticky rice in bamboo? I had bamboo sticky rice in Thailand! It was so yummy! Wish I could find some here in St. Louis. Since leaving in 1975, I've never been back to VN. Another thing we've got in common WC. Filipinos also have a sticky rice dish that is cooked in bamboo. Our version is sweet and some have coconut, I don't remember the name though. St. Louis, yeah, I think you're outta luck. I haven't even seen them in California. Let me know which cities you're hitting and I can give you some pointers. Man, so many Asians do this, guess it's not so special after all. I can't believe that the biggest bill back then was 2000. That's pretty unfathomable to me. But I guess it explains why the 500, 1000, and 2000 bills are falling apart and all the bigger bills look brand new. I used to be able to buy stuff for $200 VNese dong. Not anymore though. :( The $500,000 bill only came out in 2005. Travel AND food! Best of both worlds. =) I love watching No Reservations. I only have basic tv. Man, it's been years since I've gone anywhere. Day 18: In-N-Out Burger and the "Hidden Menu"